Experience shows that adults learn most languages, including Arabic, better when they are in an environment of immersion in the culture. This reality is behind the design and delivery of the program on Arabic Language and North African Studies (ARANAS) at Al-Akhawayn University in Ifrane (AUI). 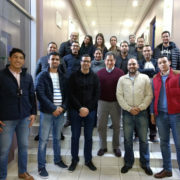 It provides participants diverse opportunities to develop language skills, learn about North Africa, and experience Moroccan culture through a wide range of interactions and activities including field trips, independent travel, community work, student and faculty engagement, and up to 190 hours of classroom and other cultural contact. Now entering its 17th year, ARANAS has hosted more than 800 students of 36 nationalities, many affiliated with North American universities. The program awards academic credits that can be applied to the students’ degree program at their home universities. Options to enhance their learning experience include homestays, learning by doing, films and cultural events, local travel and field trips, and assignments to write Arabic reports on projects in the local community. ARANAS offers three summer program options: a semester of Modern Standard Arabic (MSA) in four weeks, a year of MSA in eight weeks, or a special session of MSA in three weeks. All language faculty are native Arabic speakers experienced in teaching Arabic as a foreign language, and many have previous experience in the US. As anyone who has studied MSA knows, that form of Arabic is not encountered outside print and broadcast media. Arabs speak in their local dialects, and Morocco is no exception. Students are introduced to the Moroccan Arabic dialect through immersion activities in the local community, where they learn how to handle basic needs such as shopping, transportation, banking, and similar situations. In addition to Arabic language courses, students who elect to pursue North African Studies study side by side with Moroccan university students on subjects ranging from Islamic Civilization and Issues in Contemporary North Africa to North African Literature and Moroccan Cinema. The North African Studies faculty is drawn from the fulltime faculty at AUI with specialized fields of study including the history and culture of the Amazigh and Islamic Art and Architecture. With regard to language acquisition, the goal of ARANAS is to equip students with speaking, listening, reading, and writing skills and the cultural competency to display appropriate behaviors in basic situations. Similarly, those who also take the North African Studies courses will hopefully gain the background to grasp the complexity of issues in North Africa through studying the history, politics, economics, and recent developments in the region. With the deadline for registration fast approaching, AUI is hoping that this summer will engage a diverse body of students from North America and elsewhere who are looking for a secure, stable, inviting, and exciting milieu in which to hone their Arabic language and cultural competency skills.